Named for a favored British mystery character, "Kordelia" is also known as "KGB" around home (don't ask!). We were so pleased with the results of the first "BS x Alibi" litter that we leased her dam for a repeat breeding. As a puppy, she reminded us much of her illustrious sire with that same classic outline and she exhibits many of the same traits of her winning siblings. Since finishing her Championship, she has been a "homebody"- happy to roar around Kamgaard and keep the birds and squirrels at bay - be they real or imaginary. 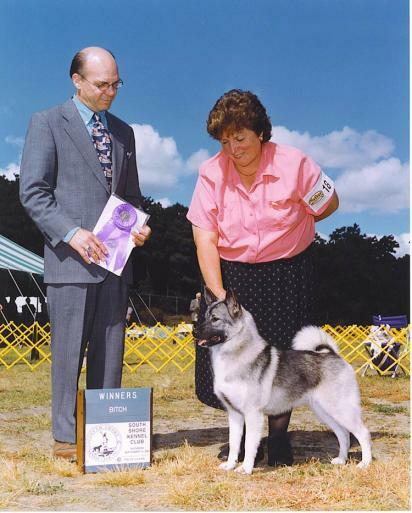 "Kordelia's" first show at just 6 months of age was the Norwegian Elkhound Club of Southeastern Michigan Specialty where she was Best in Sweepstakes under Reggie Nesbitt ("Bombey") and she flew through her Championship with ease earning ALL of her points from the Bred By Exhibitor class, thus earning the coveted American Kennel Club Medallion of Excellence! She has been bred once to half-brother, SBIS/UBIS American/Canadian Ch. Kamgaard Klearly Proud resulting in SBIS American/Canadian Ch. Kamgaard Kodiak Snowbear and our own Ch. Kamgaard Klearly Grey.